Sparkling windows. Spotless silverware, crystal or fine china. Glimmering porcelain. Dust-free furniture. Only your imagination will limit the uses for these workhorses. This item used to be #061. Also available in a pack of 6. Years ago when flour was still packaged in a cloth sack, resourceful folks discovered the sack's value for cleaning, polishing, even sewing projects. 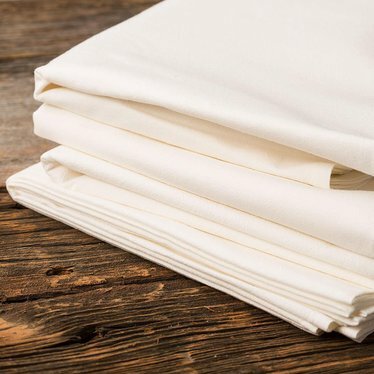 Just like the past, these durable towels are great for everyday use: drying dishes, cleaning windows, polishing silverware - use anywhere a soft cloth is needed. These are GREAT towels, however, 29 dollars is way too expensive. They have the same items at Walmart for $8. I don't want to slam Lehmans because they have great stuff and usually for a fair price, but the price on these towels is just way over the top in my humble opinion. I liked these towels so well, that I bought more and gifted them to my reletives. So far, postive feed back from them. And did Lehmans just raise the price on the ten pack? These are made well and hold their shape. Awesome. Large, sturdy, and hemmed nicely. They wash up well and are large enough to cover the entire rack of drying dishes, or to roll pasty. I agree with the other customer who said they are great for making country cafe curtains! These towels are wonderful! They are absorbent and lint free and do exactly what they are supposed to. They are quite square, more so than any other flour sack towels I've purchased. The reason for the 4 stars instead of 5 is I bought these for embroidery for gifts. Though they are a dream to stitch on the color is actually a light butter color as opposed to white. If the color is fine with you then get them! They are WONDERFUL! They are great for drying dishes. They are big enough to dry and not be soaking wet before finishing. These are great for cleaning eyeglasses. (I admit to cutting one in quarters and hemming it for manageability.) And they are surprisingly durable. These towels are great to do embroidery work on them. Very good quality. This is one of my favorite Lehman's products. I give them away all the time..they make great wrapping paper for wedding gifts. The towels arrived promptly and are just as advertized. I love the large size and the fabric thickness is perfect. My favorite kitchen towel to be sure for drying dishes or covering up the weeks' freshly made bread cooling on the counter. Thanks again Lehman's. I absolutely love these towels. I have looked everywhere for a large, absorbent, high-quality muslin kitchen towel and couldn't find what I wanted until I found these. Thank you and keep these in stock! I was surprised of the quality of these flour sack towels, so much that I used three of them for a short cafe curtain. All I needed to do was sew a rod pocket hem on each one. They are simple, clean and airy. They are also a good drying towel. I was really glad to get these towels. They help so much when cooking and cleaning the kitchen gets busy. their size makes a wonderful emergency apron and they are great side towels. Thank you for having a towel that really absorbs and stands up to hard use. These flour sack towels are awesome. I am not familiar with sack towels of the past, but I love these towels. I use them to wrap my freshly washed leafy veggies them I place them in either a paper bag or veggie bag for storage in the fridge. So far so good. I like the fact that I can throw them in the washing machine to keep them clean. The quality of this towel was very good fabric-wise. My problem was with the stitching of the hems. If I had planned to use them in my kitchen, they would have been OK. However, I wanted to do machine embroidery on them and use them for gifts. As a result, I removed the hems and re-sewed them. I have used flour sack towels all of my 50 years of housekeeping. My mother made them. When I ran out, the only place I thought might have them was your store, since I visited a few years ago. I just can't use the dinky small terrycloth towels. Thank goodness for your store. Love these! Heavier than other flour towels I've purchased, so they should last longer. Love them for all kinds of things, but especially for drying glass. Good value, too. I love these towels! Just bought more to replace my old dishtowels. Perfect for drying everything from baby to fine wine glasses. Hand or machine wash, hang on the line or throw in the dryer, iron or just fold and go. Big enough they make a great quick apron when tied around your waist! Love these towels - been buying and using them for 15+ years. An outstanding value and product! As a multi year lover of sacking towels, I found these heavier and probably longer lasting. Little shrinkage and the post towel job as glasses cleaners will be delayed. Very good.